Road asset management is one of the top priorities of the Central Asia Regional Economic Cooperation (CAREC) Transport and Trade Facilitation Strategy 2020. 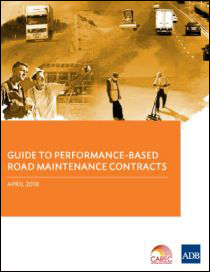 The implementation of performance-based road maintenance contracts (PBCs)—an essential element of road asset management—promotes effective and efficient maintenance of road networks. Well-designed PBCs keep roads in predefined good condition at relatively low cost. This guide aims to help policy makers in CAREC member countries understand and implement PBCs. After a brief history of the development of PBCs, it discusses the various types of PBCs and their relative advantages and disadvantages. It highlights PBC implementation in selected developed, developing, and transitional countries, including CAREC member countries, to illustrate best practices.